It’s gorilla time again, readers, as I finally explore yet another cover that has long intrigued me, featuring a hero that we’ve only visited once before. It’s the one and only Animal Man appearing in the anthology title, Strange Adventures, issue #201 from June of 1967. Check out that Carmine Infantino and George Roussos rendered cover with Ira Schnapp lettering; Jack Schiff is the editor. Sadly, the inferior interior art is by Jack Sparling, both pencils and inks and for whatever reason, the scripting for “The Mod Gorilla Boss!” has been lost in the shifting sands of time, but the dialogue really reminds me of Bob Haney in his prime with all the “hep-cat” speech patterns. The story is told from a first-person perspective and Buddy is dropping his girlfriend Ellen off after a dance. She’s sobbing and wondering aloud why he’s postponed their wedding and he assures her that they’ll “…make the church scene someday.” After she leaves he thinks to himself that with his side gig as Animal Man or “A-Man,” as he refers to his alter ego, he cannot risk exposing her to the underworld that he deals with. He thinks to himself that perhaps his abilities to assume animal powers will leave him as they have in the past, but soon he walks by a kangaroo in a cage at the Deep Hollow Pet Shop (What? Doesn’t your local pet shop carry kangaroos?) and notices that he’s gained that animal’s abilities. In the next panel, a creature in silhouette breaks down a door with brute force while his accomplices head inside to the postal inspector’s safe to loot it. Nearby, an onlooker screams, alerting Buddy, who just so happens to have his Animal Man costume in the trunk of his car. He soon “makes the scene” after observing that “…those tonsils are touting trouble!” Eat your heart out, Stan Lee. They make their escape and Animal Man discovers he doesn’t have enough gas left in the tank to pursue them with his kangaroo hops, so he ponders how to deal with the talking mod gorilla. Later, at his secret cavern hide-out, Buddy is talking with his friend, Roger, who seems to not only know his real name, but has no qualms about ribbing him about being taken down by a talking simian. A-Man heads out, determined to bring the gang to justice and to regain his standing as a hero. Taking the time to visit the zoo to gain the abilities of a gazelle, he’s soon prancing on the rooftops in search of the gorilla-led gang. Soon he spots them and plows into the minions who are lifting some jewelry from a store. As the gorilla makes a lunge for Animal Man, he puts it into reverse and high-tails it away with the bag of jewels. The ape and company beat a hasty retreat while a nearby pair of passers-by wonder if Animal Man has turned chicken. Leaving the loot in the charge of a handy guard, Animal Man visits an eagle in the park aviary and is soon in flight as he continues to search out the thieves. Tailing the getaway car to a farmhouse, our hero lands, only to be caught up in a net. 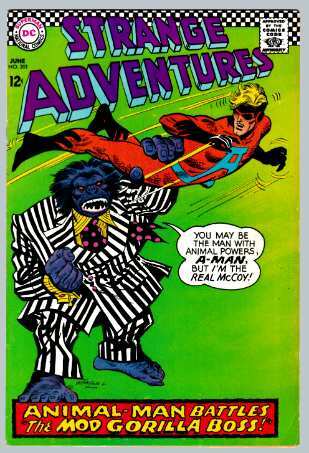 Bursting free, Animal Man aims for the skies, but the dapper gorilla grabs him by the leg and swings him around before slamming him into a wall. Animal Man begins to regain consciousness just as he’s dumped into a room that is being locked by the talking simian, who says he’ll finish him off after they get back from the parade. As luck would have it, Animal Man’s eagle powers are fading, but he’d spotted a bull in a nearby pasture, so he uses (I wish I were kidding here) his ability to mimic a baby bull in distress to draw the beast close enough to tap into its abilities. “Snort! Snort! Snort!” Once the bull is in range, Animal Man feels his body filling with bovine strength, enough to knock down one of the walls of his prison. Next, he discovers a laboratory and begins to hatch a plan, but first he acquires the flight powers of a nearby pigeon and then wings his way to the circus parade where he hopes to find his foes. Upon arrival, he sees the gorilla boss helping himself to the diamond tiara on one of the parade princesses aboard a float. Animal Man disables their camouflaged getaway car and then pursues the gorilla boss, who has jumped aboard a nearby boat. Reasoning that his pigeon powers will be insufficient, the man with animal powers dives below the surface in search of more appropriate skills and encounters an electric eel. Just the ticket. As he breaks the surface, he gives the mod gorilla a jolt, but it’s not enough to incapacitate and soon the simian is making a lunge for the nearby bridge. A-Man places a scissor hold on the ape, but the antagonist breaks free and goes again for the swing, with our hero helplessly being rotated around. Then something strange happens. The mod gorilla begins to lose steam. Soon he’s reverted to human form, just as Animal Man had hoped. The transformed man asks how he knew and Animal Man explains that when he discovered the lab and saw the charts and injections schedules, he figured he just had to keep him occupied long enough for the chemicals in his body to wear off. The authorities whisk the former mod gorilla boss away and Animal Man chalks up another one in his war against crime. Okay, my curiosity is officially satisfied, but this story wasn’t all that wonderful. The dialogue got a little thick and frankly the action wasn’t especially inspiring. I would certainly be curious who did the scripting, if nothing else allowing me to place blame and Sparling’s art certainly was a major step down from the cover art by Carmine Infantino and George Roussos. This little 11-page wonder gets a 4. It wasn’t much of an addition to the fabled gorilla gallery. Hopefully I’ll have a more worthy candidate next time, which will happen on the 15th of August. If you have a suggestion, comment or query, drop a line any time to my regularly monitored e-mail: professor_the@hotmail.com.